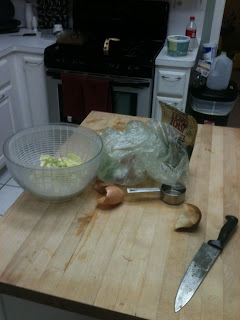 Here are some snapshots of my messy kitchen tonight. 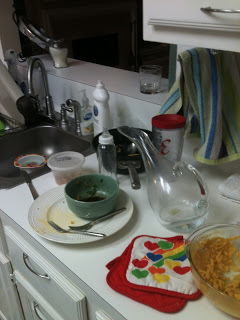 The following pictures sort of sum up how I was feeling earlier this evening…messy and overwhelmed. My kitchen and my house in general are pretty clean now (except for obligatory 2-foot pile of laundry in the armchair, see below), and I’m feeling better. The steady hymns of Gregorian chant and Latin choir music from my iPhone have truly been a sweet helper to calm my soul and refocus me over the last hour as I’ve been cleaning. Tonight, I tried to make a deer roast my dad gave us a while back, but I’m sad to report that it came out quite horribly. I added about 1/4 cup too much lemon pepper by accident, and also I forgot to prepare the meat the right way by stuffing it with onion and garlic. 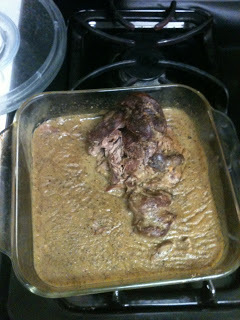 it came out looking like some twisted, overcooked mysterious animal organ. Especially the image of the meat coming out of the oven in the cooking bag I baked it in….it looked like gory evidence from one of those How-Did-They-Creepily-Kill-This-Poor-Victim shows. And yes, that’s my pregnancy food aversion talking now. 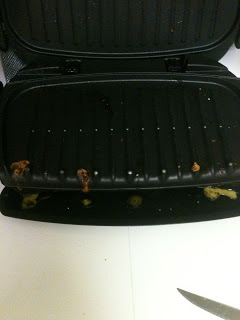 I ended up making grilled turkey sandwiches on the George Foreman grill, with salad and macaroni and cheese. 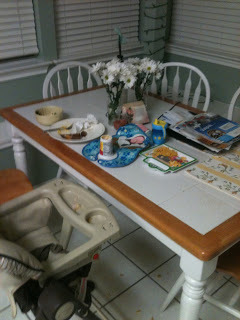 Gabriel spit out all three of these items, so I had to feed him some leftover yogurt and crackers. 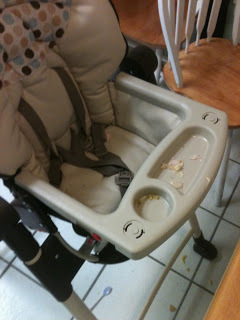 So much (tonight at least) for making my child eat what I put in front of him…. Now for a quick reflection on Things Left Undone. I struggle with Things Left Undone. Because there are Things Left Undone in my home every single day, and I really struggle with feeling often that I am always, always “behind,” that my To-Do list never gets done. When I am feeling down about my housekeeping abilities, though, I automatically reach out for God, and He always comes through for me. I have to choose to let Him come through for me though. It is always so humbling for me to let Him gently remind me to live in perspective, to count my blessings, to serve with a smile, and to live out my priorities. As I near the end of my energies for today, I realize that I’ve done alright with taking care of my priorities, in order, today. I began the day in prayer alone and then with my husband. I took a short nap after lunch today to regroup for the afternoon. I spent some much-needed time with my husband after he got home from work today. We went on a walk with Gabriel and had a good conversation. I fed my husband and son three good meals today. My kitchen, living room, and play room are now picked up and ready to go for tomorrow. 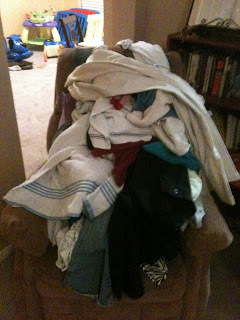 I still need to fold a week’s worth of laundry and take a shower (when was the last one?) 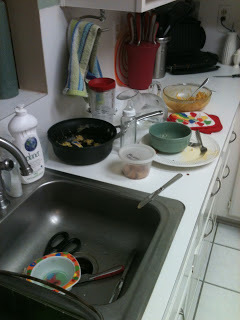 and clean out the green room closet for Chris and Jenay and go to the bank and clean my bathroom and…. That’s OK. Because all of the above can wait, for tonight. It looks pretty decent to me! My house looks 2 piles away to qualify for a Hoarders episode. Hang-on tight Mama. That's how normal it will ever be when you have kids. Take it easy! I love your honesty about the reality of life! My house doesn't usually look like the one's on t.v. shows either. You are very young in your marriage. Cherish these years together. I have 5 children 20, 18, 14, 11, and 4. The years go fast and taking care of little ones can keep one very busy. Try to remember to keep some prayer time in your days.